Now, that the 2015 NHL Entry Draft is in the books, the real fun begins- we get to chart the progress and success of the 13 area natives taken from Massachusetts and New Hampshire (Mike Robinson), and we’ll see if anyone else from that group who wasn’t picked (Cam Askew, Brien Diffley and Casey Fitzgerald all could have gone but didn’t have their names called) makes their way to the NHL. Back in 2011, I sat in the New England Sports Center rink in Marlborough, Mass. with my Red Line Report boss, Kyle Woodlief, and I remember us talking about Jack Eichel and Noah Hanifin and how exciting the two then-14-year-old players were. Having been in the business much longer than I have, Woodlief was a voice of caution that day, reminding me that the critical years of development still lay ahead- and that sometimes the early risers plateau and others move to the forefront. 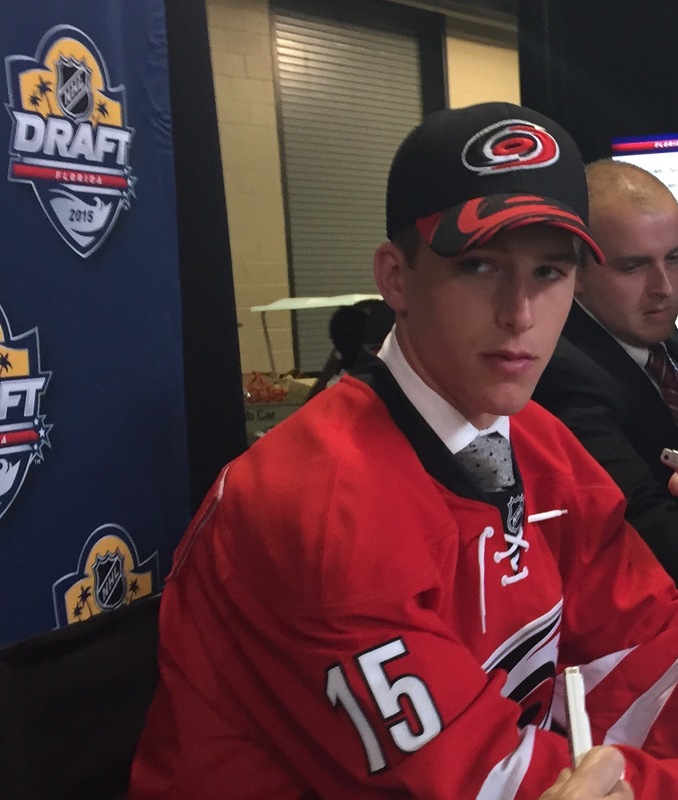 As he and I arrived in Fort Lauderdale last month, we revisited that conversation and were glad that in the case of those two terrific players, both Eichel and Hanifin continued to be every bit the players we and every other scout who was watching them back then thought they could be. Now, we get to see if the Buffalo Sabres and Carolina Hurricanes will benefit from the enormous potential shown by both. Kudos to the Ottawa Senators for grabbing Hanover’s Colin White 21st overall. He’s going to be an NHL player- he’s simply too smart and talented not to at least make it as a grinder eventually. But the real interesting question is whether he will get back to his scoring ways. He had a tough season- hampered by mononucleosis and nagging wrist and arm injuries, but as he got healthier at year’s end, he blew up at the Under-18 championship, even scoring the sudden death gold medal-winning goal for Team USA. He’s a terrific player and my bet is that he’s a natural scorer and will prove that in the next couple of years. I like the Winnipeg Jets’ draft more and more with each passing day. They nabbed a high-end offensive talent in Kyle Connor after the Bruins passed on him three times (and the Isles grabbed Mathew Barzal at 16) and continued with value selections throughout the draft. But the player no one is surprised that I will key in on is Mansfield native Erik Foley, whom the Jets landed in the third round, 78th overall. Foley is your prototypical power forward who may not have ideal height, but is naturally strong and plays hard from the first faceoff until the final buzzer. He’s going to kill it for Nate Leaman at Providence College, the team he grew up cheering for as a lad. It’s a shame his favorite hometown Bruins didn’t have more time for him as well. Mike Robinson was an interesting selection for the San Jose Sharks in the third round. The lone non-Massachusetts pick- from Bedford, N.H. by way of Lawrence Academy- has tremendous size and natural tools for the modern NHL goaltender, but we have not seen a New England high school/prep goalie taken earlier than that since Jonathan Quick was taken 72nd overall in 2005 out of Avon Old Farms. That pick turned out pretty darn well for the Kings, so if the UNH-bound Robinson delivers on his immense upside, Tim Burke and the Sharks will be sitting pretty. I liked the value where the Blackhawks took defenseman Ryan Shea (final pick of 4th round), the Coyotes picked up Conor Garland, and the Hurricanes grabbed Luke Stevens. Those aren’t bad spots to take a chance on a trio of players who are all different, but bring some nice payoff on the long road. I was not bullish on Stevens, but you’ll hear no arguments on getting him in the fifth round. As far as natural tools go, he has some of the most impressive gifts of any player from the area. Garland is a great example of not giving up when passed over in the draft and he exploded this year to lead the Quebec League in scoring, the first time in 32 years an American has done that when some guy named Pat LaFontaine blew things up in that circuit. There weren’t many surprises from the New England class, but mobile defender Patrick Holway to the Red Wings and big forward Pat Shea (no relation to Ryan) to the Panthers at 170 and 192 respectively is probably the closest thing. Both are South Shore natives, both are headed to the University of Maine, and both parlayed Central Scouting snubs into draft selections ahead of more than a few other listed guys who weren’t picked. It just goes to show you that NHL clubs do their own thing when it comes to the draft regardless of the more and more prolific public lists out there each passing year. If you can find either guy on one of those lists (Red Line included) be sure to let me know so I can give credit where due. Ultimately, the draft is a dream first step to the reaching the NHL for the 211 players selected, but that’s all it is. You won’t find former and current NHL stars Adam Oates, Steve Thomas, Tyler Johnson or Torey Krug on any draft lists, and there are far more “can’t miss” players who do just that because other players develop into better pros after age 18. In my view- guys like Askew, Diffley and Fitzgerald should have had their names called, so don’t sleep on them. Throw in Robert ‘Bobo’ Carpenter as well, but all will have a chance to make it either in future drafts (except Diffley) or via free agency. For every one of the 2015 selections- they can hang up or frame their draft jerseys, look at the photos and articles one last time and re-set their focus and personal goals: the work is only beginning.